In many countries around the world where people have very limited access to the message of the Gospel, it is easy for the truth to be mixed with folklore, traditional beliefs and practices. This is known as syncretism. GRN materials are often useful to correct doctrine as they teach the stories from the Bible in a way that is accessible for many people. 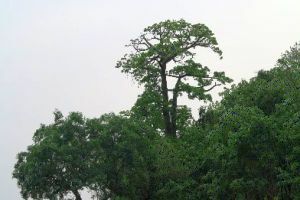 In one Nigerian community, a fetish tree before the village entrance points to the great need for the truth of the Gospel. At this tree the people seek justice, protection and blessings from their gods. When they have problems they bring them before the fetish tree. GRN Nigeria carried out an extensive distribution trip in April. In each community the team gave GRN materials to the people, telling the story of Jesus in a language they could understand. The GRN team provided this village with Saber players, Good News flip charts and CDs in the Sheni language. In another settlement nearby, the whole village gathered as they heard their language on the loud speakers. This community has special rocks near their houses which were used as hideouts from their enemies but now the community view these rocks as fetishes. GRN materials (Saber players, Good News flip charts and CDs in the Sheni, Fulfulde and Hausa languages) were distributed among this community. Pray that the materials distributed will convict those who hear the truth of the Gospel. That they might abandon the practice of fetishism and trust in Christ alone to meet all their needs. That they may build their faith on Christ the rock. We often think of GRN materials as useful for evangelism but have you considered their value to Christians? In many countries there are Christians who cannot read and are isolated from other believers because there is no church. They have no way of reading or hearing God's word. It is very hard to grow as a Christian in this context. It is easy for them to become discouraged and return to their old life. In this context GRN materials can encourage and strengthen Christians in their faith. The recordings and flipcharts provide a means for believers to share the Bible stories with others in a non-threatening way. 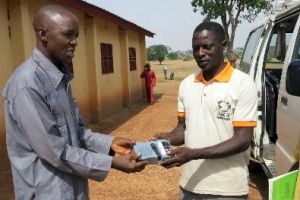 In the last area of the Nigeria distribution, the team resourced several local pastors with GRN materials including Saber players, Good News flip charts and CDs in the Chokobo, Hausa and Fulfulde languages. The team also taught people how to use the materials effectively. Pastors particularly appreciated the help these resources would be to their people. The team reports: "The pastors could not hide their joy for viable evangelism materials available in their mother tongue which would facilitate their understanding of the message." Pray that the materials will bring hope to Nigerian believers, that they may boldly proclaim His message.